Angela de la Cruz gives her paintings a rough time. Many of them begin their lives as the children of a somewhat maverick, more-sensuous-than-usual modernism, with monochrome paint lavished opulently in slick glossy layers or parallel horizontal lashings on canvases. But then all havoc breaks loose: the stretchers that traditionally held the canvas taut, now buckle and bend, and that’s when they aren’t smashed and twisted completely out of line with the vertical plane. Slashed canvases slither from their supporting skeleton like Marsyas’ flayed skin and lie crumpled on the ground. Paintings shrink into corners, as if in shame, or have their hems ripped off, to dangle loosely by a few threads. Canvases peel away from their support and together, canvas and frame lie on the floor in ravaged terror or exhaustion. With such processes of violent dismantling, de la Cruz lays bare the facticity of the materials she uses (wood stretcher of a certain thickness, cotton duck of a certain grain and variety, slick oil paint with its rich, turpsy smell and its historical baggage). But she’s also doing much more than this. It’s not accidental that the language I’m using to describe how Angela de la Cruz assaults her paintings is anthropomorphic. There is, clearly, such intent. She has idiosyncratically described her works as “person-objects”. They are “ashamed, angry, survive car crashes and hurricanes, sometimes suffer amputations, or even apologise for the simple fact that they are only paintings.” Such personality, such biographical detail (the life story of a painting incorporating its moments of pride and humiliation) is bolstered, rather than created, by the titles that pin the works to specific associations, particular narratives. 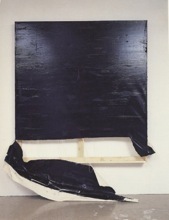 Ashamed (1995) is a small, scuffed white painting, its edges flaking, its stretcher folded in upon itself, huddling in a corner. Homeless (1996), a much larger piece, similarly painted a dirty white, is also a corner piece. With its stretcher broken and bent to fit the recess, it stands inelegantly with nowhere else to go. Here, the canvas attaches itself to the broken stretcher like an ill fitting, shabby dress. In Shrunk to Fit (2000) and the series Loose Fit (2000), the canvas is much too large for the frame and sags and rumples where one would expect a monochrome painting to behave itself crisply. The relationship between a canvas and its stretcher is clearly, for de la Cruz, analogous with that between a body and the clothes it wears, and frequently, the act of divesting those clothes is a violent, aggressive one. Where blades enter the picture, lacerating the canvas away from its support, things become, well, almostnoir. Such animation – the attribution of human characteristics and agency, and with it, the invocation of drama and narrative – brings to the work of this artist a punchy, almost slapstick humour. It’s a seductive ploy for work that so seriously places itself within a discourse of art making that is dry, analytic, frankly intellectual. For the works of Angela de la Cruz talk to modernism not so much through the slashed paintings of Lucio Fontana, as through the hybrid painting/sculptures that began to appear in the 1960s, works that vexed and prodded the status of art objects and collapsed the barricades keeping sculpture and painting apart. “Neither painting nor sculpture” was how, in 1965, American artist Donald Judd famously described “specific objects” that had begun to appear in the early 1960s, works that were formally pared down, minimalist like his own, but that sidestepped what were then the strictly held distinctions between two- and three-dimensional works of art. Judd’s attribution of the term “specific objects” gave voice to a disaffection with the formalism that wished not only to classify and assess works of art according to their medium, but also implied a range of mandatory practices linked to that medium. 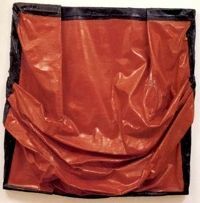 As most famously expressed by American art critic Clement Greenberg in the 1940s and 50s, medium specificity demanded that a painting (material applied to a two-dimensional surface) be, in the first instance, flat. Indeed, it had to be not only flat, but also an exercise in the phenomenology of flatness, an affirmation of the quality of such flatness, nowhere piercing the two dimensional pictorial surface with an illusion, perspectival or otherwise, of the third dimension. Against such militancy, Judd’s specific objects turned the notion of medium specificity on its head. But strangely, for Judd, these specific objects emerged through paintings that were not only flat, they were hyperbolically flat: Frank Stella’s black canvases. With colour expunged and flatness now an inert and deadpan characteristic, Judd realised that a painting that apparently exemplified Greenbergian medium specificity could actually turn the same condition around. Such a painting could be acknowledged not as a representation of something that exists in the real world (Greenberg has already seen to the fact that figurative painting was out), not as a self conscious reflection on the act of representation (Greenberg’s definition of modernist formalism incorporated the object’s capacity for self critique), but as an object that took its place in the phenomenal world alongside other three-dimensional objects. A thing, occupying a specific three-dimensional (albeit limited) space. A similar realisation of the thingness of painting, its objectual nature, occurred to Angela de la Cruz: “One day I took the cross bar [of the stretcher] out and the painting bent. From that moment on, I looked at the painting as an object.” De la Cruz’s works are historically distanced from Judd’s specific objects, but they orbit within a similar constellation of concepts and can be more fully grasped when viewed in the context of the transformations that assailed the status of painting in the second half of the twentieth century, and the frequent rumours of its demise. While being sensuously painterly, de la Cruz’s pieces are also intelligently sculptural: “All I do,” she has observed, “is use the language given to me by history. Painting is a tool for expression. But it doesn’t belong to me.” Her relationship with painting, then, is one of simultaneous seduction and, quite literally, dispossession. This is, perhaps, more obvious in works that eschew paint altogether and explore everyday objects for their sculptural qualities. De la Cruz has employed the carcasses of metal cabinets and made large wall pieces out of disassembled and re-assembled Art Deco wooden wardrobes. These works have a strong affinity with the recycling and constructive processes of Colombian artist Doris Salcedo, perhaps most famous in the U.K. for Shibboleth, the 167-metre long crack she inserted into the floor of the Turbine Hall at Tate Britain in 2007. While the painting based works by de la Cruz are radically and even aggressively deconstructive, the wardrobe pieces more delicately maintain a certain respect for the integral object, even as they remove its functionality. A small, well curated exhibition of Angela de la Cruz’s work at the Camden Arts Centre in London (April-May 2010) brings a carefully selected group of her works for the first time to a public gallery in the U.K. Trained at Goldsmiths College and the Slade School of Art, the artist was born in La Coruña in Spain in 1965, but has made London her home for the past two decades. With the memory of a recent exhibition of small works by Eva Hesse at the Camden Arts Centre still fresh in one’s mind, de la Cruz’s show is cleverly paired at this venue with an exhibition of work by Italian born, Brazilian based artist Anna Maria Maiolino, whose obsessive and organic forms (evoking both bodily organs and food) also unsettle certainties about the nature of art objects. Together, this trio of women artists suggests that a thoughtful, playful, experimental response to materiality might be a feminist issue, for in different ways, these three artists unravel the epistemological and ideological underpinnings of a bold and optimistic Modernism that is historically linked to a robust masculinity. The beauty of de la Cruz’s works erupts in the juxtaposition of their painterliness with an abject quality, a sense, almost, of humiliation: the way they seem to brave various attacks and assaults and still compose themselves. Two works are particularly worthy of mention in this respect, though for being more literal, they are not necessarily the best in the show. 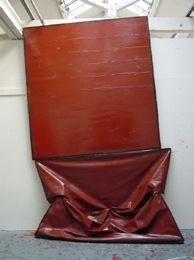 In Self (1997), one of the earliest pieces on show, a grungy, broken brown painting sits on an armchair, contemplating its intact twin hanging on the wall. This seems to be telling us something about the restorative nature of art, its capacity symbolically to repair a broken self. This work functions in stark opposition to an adjacent one, Flat(2009), that offers no such redemptive hope. This is also the work that most closely approximates an assisted readymade, with a single operation marking the artist’s agency in its making. An orange chair made of plastic and metal – the kind of chair commonly used in church halls and waiting rooms – lies flattened on the ground. Splat. Its inability to raise itself seems terminal, complete. On first viewing, this seems like a simple reversal of the artist’s earlier work, now rendering a three-dimensional object almost pictorial. But knowledge of de la Cruz’s biography invariably intervenes: this is one of the first works the artist made, together with her assistants, after lying paralysed in hospital for months, having suffered a brain haemorrhage while working on a large exhibition of her work in Portugal in 2005. If it is remarkable and unusual for works of art essentially so non descriptive to suggest narratives and elicit empathy, this work especially pulls one up short in its nakedly autobiographic nature. In doing so, it hyperbolises a condition of humanity that lies at the heart of Angela de la Cruz’s forceful and witty reflections on the nature of art. As a stark metaphor for the body itself, it asks us to review the artist’s earlier works too, and to recognise them as essays in vulnerability and endurance. * Linda Nochlin, “Women Artists Then and Now: Painting, Sculpture, and the Image of the Self,’ in Global Feminisms: New Directions in Contemporary Art, exhibition catalogue, Brooklyn Museum, New York, 2007, p 50. Angela de la Cruz, Ripped, 1999. Oil on canvas, 222 x 181 x 28 cm. Courtesy private collection London. Angela de la Cruz, Homeless, 1966. Oil on canvas, 220 x 200 cm. Courtesy Wilkinson Vintners London. 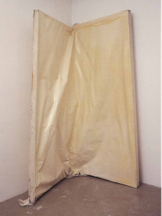 Angela de la Cruz, T-Piece, two wooden wardrobes, Courtesy the artist and Lisson Gallery, London. Angela de la Cruz, Flat, 2009. Courtesy the artist and Lisson Gallery, London.